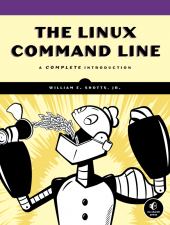 What if you had a book that took you from the very beginning of the Linux command line options, and it took you through progressively interesting and relevant topics so that you really could develop a mastery of the shell? Oh, and what if it were written in a fun style that was less wonkish and easier to embrace and follow along with? Less tech, mode dude. William E. Shotts, Jr.'s “The Linux Command Line” manages to do that.